Growing hibiscus plants is a great way to bring the tropics into your garden or home. But planting tropical plants in non-tropical climates can be tricky when it comes to light, water and temperature requirements. The amount of sunlight you get in your garden may not be what your new tropical plant is used to getting. Keep reading to learn more about light requirements for hibiscus plants, both indoors and out. 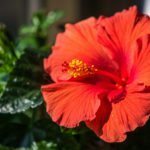 How much light does a hibiscus need? As a rule, a hibiscus plant needs about 6 hours of full sun per day in order to bloom to its fullest potential. It will still grow perfectly well in partial shade, but it won’t fill in as fully or bloom as spectacularly. The more light a hibiscus gets, the better it will bloom, up to a point. There is such a thing as too much light, especially when it’s combined with hot and dry weather. If you live in an especially hot and sunny zone, your outdoor hibiscus will actually benefit from a little bit of shade, especially to protect it from the bright afternoon sun. This can be achieved well by the dappled shade of leafy trees planted to the southwest of the hibiscus. Despite the light requirements for hibiscus plants, it’s possible to grow them indoors. You just have to make sure conditions are bright enough. Always place your container grown hibiscus in a south or southwest facing window where it can get the most light possible. Being positioned in a sunny window is usually enough to keep a hibiscus plant growing and blooming well. If you simply can’t meet hibiscus light requirements from sunlight alone indoors, you can always supplement with artificial lights. And that’s basically the gist of it. Keeping your hibiscus healthy and happy is easy when you provide what it needs – adequate water, warm temperatures and plenty of light.